This paper investigates approaches to authorship in The Long Weekend in Alice Springs (2013), a graphic adaptation by the Australian artist Joshua Santospirito of a psychoanalytic essay by Craig San Roque (2004). Because the subject of both essay and adapted text is the ability of stories to have lasting effects over time in a space of crisis, this unusual adaptation establishes itself as an unusual site of authorship, whereby multiple authorships create a complicated authority, and stories themselves are shown to be significant. Through its variable positioning of the different roles undertaken by the author, the adaptation struggles with the ongoing challenge of appropriating Indigenous storytelling and suggests a possible way to discuss these stories from the outside. Through analysing paratextual materials and the work itself, this paper shows how nonfiction comics can both convey stories and separate themselves from stories through destabilising notions of creation and authorship. We use the term ‘comics’ in the singular to denote the medium of comics, comparable to the mediums of literature or film, as in ‘the comics adaptation’. We use ‘nonfiction comics’ to denote a work of nonfiction in the medium of comics. We use the term ‘graphic novel’ to denote a book-length work of comics which may be fiction or nonfiction. When we use the title The Long Weekend in Alice Springs we are referring to the graphic novel adapted by Joshua Santospirito (Santospirito 2013). Craig San Roque’s original 2004 essay is named ‘A long weekend / Alice Springs, Central Australia’ throughout this article (San Roque 2004). 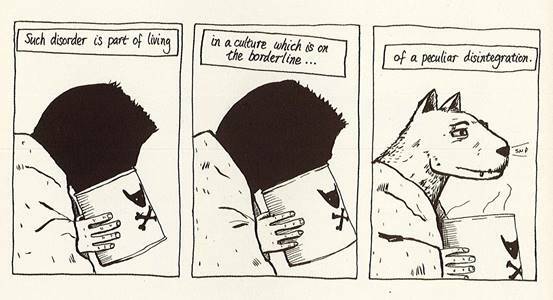 In one of the many nested stories in Craig San Roque’s The Long Weekend in Alice Springs, a graphic adaptation of a psychoanalytic essay set in the predominantly Indigenous central Australian city of Alice Springs, the narrator comments on a variety of disorder found in a culture ‘on the borderline … of a peculiar disintegration’ (Santospirito 2013: np), a culture in which a white narrator observes social crises caused by Australia’s history of invasion and its ongoing consequences for Indigenous populations. This paper analyses the peculiar in-tegrations in The Long Weekend in Alice Springs (2013), adapted by the artist Joshua Santospirito from a 2004 essay authored by Jungian analyst Craig San Roque. Just as the medium of comics combines categories of text and art, and the essay under adaptation tells the story of a city in crisis, this work combines multiple approaches to authorship. This paper uses The Long Weekend in Alice Springs as a case study in approaches to and effects of comics authorships, particularly because the graphic adaptation builds from a work that is already built on stories belonging to others. It investigates the possibilities created by the comics form when its capacity for plural authorship is used to advance an argument. In this case, both the original essay and the comics adaptation argue that historical events affect subjects in space long after the events are over. As white authors telling the stories of Indigenous populations, both San Roque and Santospirito can be considered arbiters of authority over the Indigenous communities, bodies and identities discussed in the text. In a comic told by two people undertaking blended roles of author, protagonist, adapter and narrator, the reader is asked to focus on what is being told but also how this is inflected by who is doing the telling – which suggests an approach to the adaptation of Indigenous stories that is at once problematic and novel. Through analysing The Long Weekend in Alice Springs, especially its process of adaptation, this paper shows how nonfiction comics can respond to questions of adaptation, origination, and authority while opening others. Throughout the paper we use methods of textual analysis within the conceptual frameworks of comics scholarship and Indigenous studies. The de-centralisation of the author in The Long Weekend in Alice Springs is partly to do with the work’s dual status as ‘original’ and adaptation. Indeed, the work’s meaning comes from its shared authorship. In comics, terminology of authorship can be contested; we don’t know whether to call someone a creator, an illustrator, an author, a comics-maker, a cartoonist, etc. In The Long Weekend in Alice Springs, this is further complicated by the fact the work is an adaptation, and that an ‘original’ of the work exists. 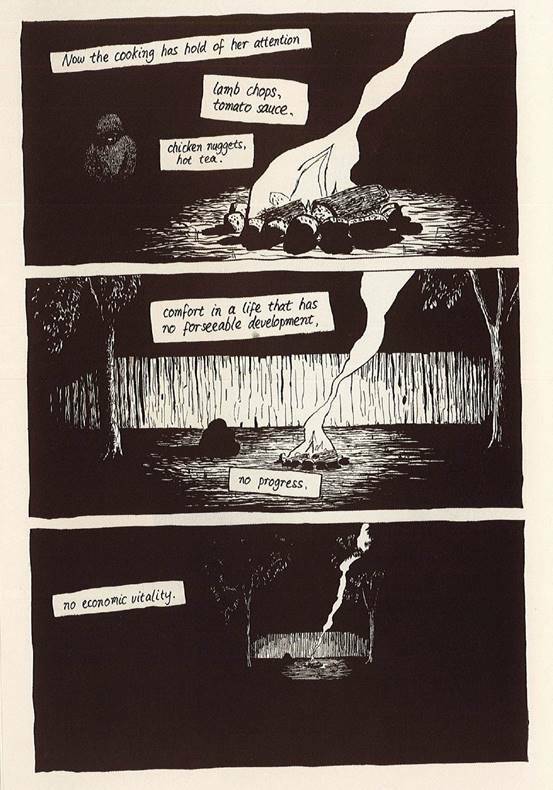 Approaches to this process can be diverse; another example in Australian comics is Nicki Greenberg’s 2010 Hamlet which is ‘staged on the page’, and includes no reference to a constructed narrator or implied author; in fact, it partakes in the ‘objective’ point-of-view which James Joyce, following Flaubert, described as taking place while God files his fingernails. This section of the article looks at the process of adaptation and questions who is considered to be the ‘author’. One of San Roque’s abiding and profoundly complex ambitions, as demonstrated in both publications’ references to the ancient myth of Innana and Dumuzi (also a myth of seasons and fertility, though originating in the Middle East), is to reconnect settlers to an awareness of their long-lost cultural stories, to ‘put us imaginatively back in touch with ancient understandings of the earth,’ as Kieran Finnane put it after attending a performance of Persephone’s Dog (2016). This then might give settlers a way of better seeing Arrernte history and hearing Arrernte stories, and invite a way towards a common, or at least shared, cultural ground. Reading both essay and adaptation, we watch San Roque moving through the events of this long weekend, using them to detect patterns in history and time in search of ‘psychic structures’ embedded in a site through historical events, which thereafter repeat themselves through present-day behaviours. San Roque notes that, ‘observing an evolving, partially unconscious cultural complex is inherently difficult and even harder to represent’; as such, the aim of the essay is to portray this through a ‘mood, or a feeling tone which can be thought of as the emotional effect of the cultural complex on the group and individual ego (including the writer’s)’ (San Roque 2004: 46). The essay is personal, lyrical and meditative, as is the graphic adaptation. After encountering the essay in 2008 he ‘began drawing bits of it’ (Santospirito 2013: Introduction) and completed the book-length work over five years (Scully & Santospirito 2015: 135). In the introduction to the adaptation, he writes, ‘Somehow drawing all of this strangeness helped me make some sense of it’ (Santospirito 2013). 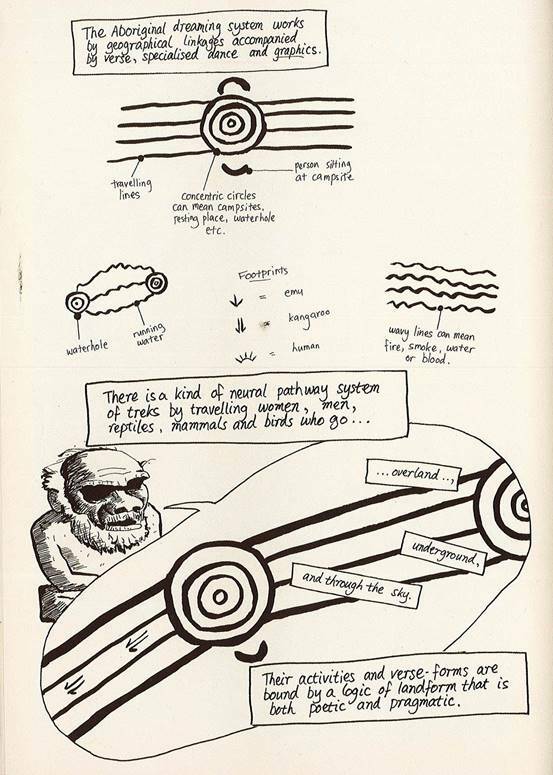 Thinking that ‘a graphic novel adaptation of an academic essay about Jungian concepts’ would be ‘impossible to pitch’ to international and local mainstream publishers, Santospirito formed San Kessto Publications with Nadine Kessler, effectively self-publishing the comic (in Sadokierski 2014). The Long Weekend in Alice Springs was well-received by the Australian comics community; it won the ComicOz Award for Best Australian Original Comic Book in 2013, was shortlisted for the 2014 Ledger Awards, and won the 2014 Northern Territory Read Non-Fiction Book Award. The main section of The Long Weekend in Alice Springs opens with the text: ‘I can see a campfire in our backyard’ (Santospirito 2013). This aligns us firmly with San Roque in narrated time, both through the use of present tense first person and by positioning us within his limited sight; we see the shape of a person in outline, both revealed and concealed by the campfire. In other words, while for the bulk of the comic we see a free mix of images ‘as seen by’ San Roque and ‘as seen by’ Santospirito, including an avatar of San Roque himself, as well as many images that could only exist as metaphor and myth and depictions of events in historical time, in these opening pages we see approximately through San Roque’s eyes. San Roque’s focus (and ours) is on other characters. While Santospirito is presenting San Roque’s consciousness to us, San Roque is presenting others for us, too. Here, a white Australian man – in fact two – are attempting to tell the story of an Indigenous Australian woman, exercising authorship of the story and potentially denying the agency of the character under discussion. We see an Aboriginal woman, Manka Maru, hunched beside the fire. ‘Her black clothing, her black skin, make her almost… invisible,’ the narration reports. It goes on to explain she is the widow of a man who has won an award and died of heart failure and alcoholism. She won’t discuss her husband, but instead ‘ponderously gazes’ at Polaroids of him that she keeps in her bag. This description appears in drifting narrative boxes on a white borderless page beside a strikingly outsized portrait of Manka Maru. It’s clear that the narrative focus here is on the woman herself, whose eyes and posture demand to be engaged with by the narration, though her arms and legs are crossed, suggesting that she would not want to be engaged with in the world of the story (see Figure 1). The following page is used to introduce the themes of the story and the lyrical mode in which San Roque addresses them: ‘Now the cooking has hold of her attention / lamb chops, tomato sauce / chicken nuggets, hot tea. comfort in a life that has no foreseeable development, / no progress / no economic vitality’ (see Figure 2). These phrases appear in floating narrative boxes, askew in comparison to the straight edges of the panels. Three long panels of identical breadth show the ‘eye’ of the panel moving further and further away from the woman and the fire. In the final panel of this sequence, the image has receded dramatically and is surrounded by a pool of black, the white narrative box in sharp relief, drawing the eye. Then, per San Roque: ‘I don’t know how to think about these things / I do not really know how to represent the action of a “cultural complex” to myself’ (Santospirito 2013). He stops writing and looks off into the distance; and it’s here that we see him smoking a cigarette and watching the woman by the fire, who we met in the first section. ‘This weekend I sat down to think and it was as though shades came to visit with a purpose’, the narration says. This is evocative language, and it introduces San Roque as the experiencing mind through which we will engage with the idea of the cultural complex. Yet it also introduces the idea that experiencing minds are not the only progenitors of events and stories: shades can visit, and with purpose; stories surround and compel our behaviour. the doors opened out onto the scene. I’m trying to develop a theme for this essay that I’m writing … but I feel interrupted by these … incidental … bacchic… Visitations. This story is typical in its mix of anecdote and firsthand experience, and particularly in the range and distance of subjects and participants: the cousin-sisters, the lawyers, the shared knowledge of the court, the deceased man, the hearsay; the ‘many’ for whom death is relief. Santospirito’s artwork both graphically bridges many of those distances and itself serves as another layer of interpretive webbing. On a single page, we see San Roque facing the reader and overhearing; the lawyers pausing; the lawyers overhearing; the lawyers going back to their work; and depictions of Maga committing violences that are drawn crudely and so perhaps meant to stand archetypically (see Figure 3). In other words, the roles of participant and narrator are muddied in the space of the page, which depicts spaces both remembered and imagined. On the following page Maga is gradually transformed into the image of a dog, as a means of transitioning into a different story, which takes place in a different car. In terms of Alice Springs, we are in a culture ‘on the borderline … of a peculiar disintegration’ (see Figure 4). It is apposite that we are on the borderline of a disintegration, and re-integration, of notions of participation and narration too. The above sequence could serve as a synecdoche for the graphic novel as a whole, demonstrating the text’s care and caution to show stories as being filtered through a range of listeners and tellers who bring with them a host of assumptions and biases. Though the depictions of violence sit centrally in this particular narrative, and hold the most visual power in their starkness, the reader is cautioned from viewing these images as ‘true’ by the nested images of overhearing and retelling surrounding them. While narrating these incidents, San Roque also interprets: ‘I am trying to work out if certain culturally defining events that happened in the past also take place in the present … as a psychological inheritance’ (Santospirito 2013). As he does so, it becomes clear that Santospirito’s artistic choices are a means of exploring the same themes. Maga lifts his head from the petrol he’s sniffing to reveal his head transformed into that of a dog. The following anecdote is of a traumatised man who is sitting in a grey Ford with a dead dog wrapped in a blanket on the back seat. They have been sitting there for three days. ‘The animal, who is almost human,’ writes San Roque, ‘begins to illumine us all with a sense of grief’ (Santospirito 2013). A few pages later in the book, we read that the ‘principal dreaming for the site of Alice Springs’  concerns ‘a wild dog that comes in from the South through a gap in the mountain range, attacks the incumbent male and ravages the mother and puppies’ (Santospirito 2013). Santospirito’s repetition of the image of the dog-human across these passages enriches the idea of the cultural complex spanning time and space. The transliteration of stories between real life, gossip, culture, San Roque’s essay and Santospirito’s comic is closely bound up with the essay’s meaning; the purposes of content are matched to the parameters of form. To observe and narrate crisis – and here ‘crisis’ is taken from its etymological root as the point of change, the turning-point of a disease, the moment of decision, selection or discrimination – compels a crisis in the text. Both San Roque’s essay and Santospirito’s graphic adaptation are mantled by a series of beginnings and endings that draw attention to the respective author’s decisions, selections and acts of narration. As such, both engage in metanarrative, and this metanarrative seems highly appropriate, even inevitable, when dealing with matters of social and postcolonial crisis. Paul Atkinson argues in his essay The graphic novel as metafiction on the graphic adaptation of Paul Auster’s City of Glass, that ‘the structure of the graphic novel is such that the verbal narrative is always incorporated into the spatial field, which … is accorded ontological priority’ (Atkinson 2010: 107). Atkinson examines the ‘upper limit’ of the voice in literature, the implied authorial voice, as defining the border between the inside and outside of the text. 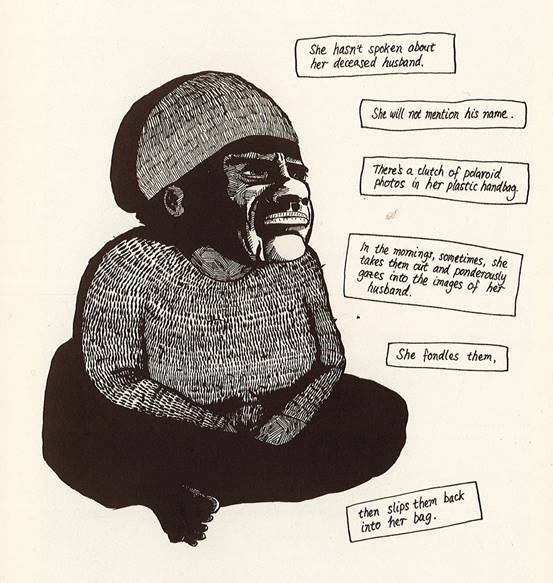 ‘In the graphic novel, however,’ Atkinson writes, ‘another container always frames the voice: that of the panel and page, which are visible borders limiting both image and text’ (Atkinson 2010: 117). 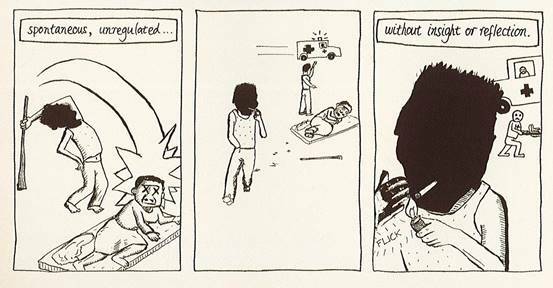 Atkinson’s argument is that comics, in its very form, draws attention to acts of selection – points of crisis. In June 2018 Santospirito published a follow-up minicomic called The Tension, relating his anxiety around The Long Weekend in Alice Springs’s success and its repercussions: ‘More visibility = Greater risk of backlash’ one panel reads (Santospirito 2018: np). Most pages contain a mixture of panelling and ‘free-floating’ images and words. One of the latter is titled ‘How to get tied in knots’ and depicts a small image of Santospirito surrounded by floating words like ‘Impostor syndrome’, ‘yet another white man’, ‘Knowledge that good intentions are not good enough’, and ‘Does this book somehow do further harm to Indigenous peoples?’ The 2018 comic book serves as another ending, another instance of metanarrative, of the author drawing attention to the text’s own acts of crisis. Throughout the process of adaptation, the relationship between San Roque and Santospirito was informal, variable, and close. For example, the version of the essay Santospirito initially worked from was drawn directly from San Roque’s laptop; it was only when Santospirito ordered the published version that he realised certain gaps existed between draft and finished form (Scully & Santospirito 2015: 137-138). Santospirito was able to show San Roque preliminary drawings in person: ‘I don’t know if he completely understood where it was going, not being a comic reader, let alone a comic-maker. But then a comic-adaptation of an essay is a difficult thing to explain to people in a half-completed form’ (Santospirito qtd in Sadokierski 2014). As the book developed, he sent San Roque ‘the occasional email, or when I went to Alice Springs for work I showed him where it was up to’ (in Sadokierski 2014). According to Santospirito, San Roque’s ‘interest’ grew as the book grew in size, ‘probably because he could see where it was going’. When Santospirito sent San Roque a ‘stitched photocopy booklet of the first 60 pages or so’, San Roque took this to conferences and discussed it with his colleagues. For Santospirito though, ‘[t]he project was not a collaboration in a true sense’ until the work was completed and he asked San Roque to contribute a new essay (A Book of Sand) for inclusion in the back of the book: here, he ‘inadvertently became an editor’ (in Sadokierski 2014). However, although the finished comic is not a collaboration, it is positioned as the result of nuanced, plural authorships, in ways that go beyond the courtesies of attribution. The positioning balances different impressions of Santospirito and San Roque, sets them in different stances against and among the stories being told. Essays, interviews, promotional materials, and copyright indicia each play a role in creating a separate impression of the authorship of the text; key terminology is used interchangeably; San Roque and Santospirito refer to each other and the text in ways that suggest varying impressions of its relationship to an author, or multiple authors. In small ways it confuses the relationship between paratextual materials and primary text. This is first signalled on the cover, whereupon the comic is formally titled Craig San Roque’s The Long Weekend in Alice Springs. Following this, the credit appears as ‘Adapted and drawn by Joshua Santospirito’. taking the reader through a series of poetic thoughts, places and time zones. Set over the course of a football long weekend in the central Australian desert town of Alice Springs San Roque grapples with his analysis of history, culture and the pain which unconscious complexes, intentionally and unintentionally, inflict upon other cultures. (Watch This Space Inc 2013). The text invites the reader to imagine Santospirito ‘at the time of reading’ and then to imagine his engagement in the time that followed; the result of which is the comic we are about to read. In other words, these paratextual materials go beyond placing the adaptation in dialogue with the adapted work. Instead, they narrativise the act of adaptation, and position Santospirito as both a reader and an author; he is a character in the story of the production of the text. This is not an uncommon tactic in nonfiction comics; for example, in many of Joe Sacco’s nonfiction comics, notably The Fixer (2003), Sacco tells both another person’s story and the story of the telling. The differences are apparent; chief among them is that Santospirito is setting up an extended personal narrative that is also an account of a thought process, a particularly interior experience – an essay. Both essay and adaptation have the quality of a meditation. At the same time, their material is the stories of people who may lack the resources to publish material in scholarly journals or work on extended artistic adaptations. The use of other people’s material, the varying roles of Santospirito and San Roque, are built into the meaning of an extended text. The capitalised and underlined word ‘think’ emphasises it as the key verb of this passage. What actually follows, though, is a work that performs observation, yes, but also performs complex acts of thinking, synthesis, and theorising using the language of psychology and cultural anthropology. San Roque’s drawing on art, poetry and collaborative storytelling throughout his career speaks perhaps to the deficiency he identifies here within the ‘thinking’ methodologies of his training and education. The early pages of the comic foreground the act of adaptation, blending paratextual and narrative material and positioning Santospirito as both creator and experiencer of the work. The first page of the comic reads, ‘I don’t know how to think about these things…’ and shows a pencil resting on two blank sheets of paper. In narrative terms, this shows San Roque beginning his essay, and positions San Roque as the protagonist of the forthcoming story. It also shows Santospirito beginning his adaptation; it shows the impasse that incited the original essay and the impasse that incited the present work. In other places, the language of ownership seems deliberately blurred. In an introduction to an extract from the work, San Roque writes that Santospirito ‘has taken my original essay and, with cinematic skill, has constructed a graphic account’ (San Roque & Santospirito 2016: 29). Although this language refers to a different mode of media production, this language at once acknowledges the visual dimension of the comic, the work (‘construction’) of adaptation, and the shared quality of the events under discussion, which exist independent of their narration (the comic is an ‘account’). In the same introduction, San Roque describes himself as both ‘narrator’ and ‘alter ego [recounting] incidents in local life and death’, both a construct that tells the story and a participant in the story. I hear Craig’s voice [when he reads the comic], but of course there is a lot of me in the images. There is probably a word for the overall voice of a comic – which I’m part of. But it is clearly Craig’s voice I hear when I read the words on the page. The overall voice of a comic can be formulated in different ways, eg Marion’s term graphiateur (Marion 1993) for the ‘graphic impulse or graphic enunciation that is manifest in all levels of structure and narration’ (Atkinson 2009: 270), and which is not dependent on sole authorship but which is expressed through the hand of an ‘implied’ author. Style should be considered as a unified idea: ‘The voice in comic books is not directly comparable to speech or writing but should be considered rather as a graphical “grain” or tenor which cannot be reduced to what is shown or said’ (Atkinson 2010: 122). This term is descriptive, but viewed in light of the work’s materials – Indigenous lives, and particularly their use in the lives and creative and scholarly works of white observers – notions of authorship and collaboration are not quite swallowed into an idea or impression of an implied author; rather, their instability becomes part of the narrative, and part of the reading experience. This ‘new and altogether bizarre creature’ – what the reader experiences as ‘voice’ – is a narrative composite that requires not just an understanding of comics and indeed voices, but an understanding of authorships, of the comic’s status as an adapted work and perhaps especially of the comic as a nonfiction work: that is, a text that draws some of its meaning from its relationship to the world. The supposed remit is to document San Roque’s experience of Alice Springs over a long weekend in 2002, but the text’s status as an artefact with reference to the real world also depends on Santospirito’s experience of San Roque’s work. The comic, then, performs a kind of sharing of authority: its value is both interpretive and documentary, presenting twinned experiences of authors engaging with real life. It suggests that both San Roque and Santospirito are separate from the events being described, thus opening itself to questions about the relationship between storyteller and story: who has authority here? Where is the line between participant and appropriator? Are stories always larger than their teller? For San Roque, who spends much of the essay and comic walking and thinking – covering ground – and for Santospirito, who traces and enciphers San Roque’s wandering route, space serves both as background, embedding narrative and experience, and influencing experience. For San Roque, sites ‘repeat’; they emanate ‘psychic influence’; they ‘regurgitate … fundamental acts’. Rather than discrete phenomena, events are ‘encipherments’. In conveying time and space using the same physical areas, comics cause ideas to exist in succession and simultaneity. However, the question of succession and simultaneity remains complicated, particularly in the construction of the narrator, a reminder that neither form or content are neutral; nor are their values necessarily fixed as a text continues. When adapting the essay, Santospirito was nervous of his status as ‘a white man, adapting another white man’s text about cultural matters’, specifically matters concerning the mental and physical health of Indigenous Australians (Sully & Santospirito 2015: 143). This anxiety is built into the work. The authors are repurposing and re-authoring stories under discussion, stories originating in Indigenous Australian communities. In a work that is in many ways ‘about’ adaptation – by foregrounding the shared role of the author – it is also a work that foregrounds story, and the fact that stories belong to someone else. Arguably, the act of adapting the essay puts two authors in dialogue with each other; the comic also enters a power dynamic between appropriator and author/originator that stands behind this dialogue. Rather than suggesting that the question of authority and authorship is resolved, we note that comics as a medium can open possibilities for ideas about the multiplicity of author and narrator. The comics form poses challenges to discrete divisions between authors, protagonists, subjects, and narrators; a single-authored autobiographical comic, for instance, commonly features an avatar of the author (a protagonist) who experiences events, a textual narrator who often exists separate from the panel’s present tense, and the sense of an author-narrator, an organising consciousness – an intimate consciousness, because the comic reproduces traces of the hand (see El Refaie 2012). In a work ‘about’ stories and particularly one suggesting their collective significance, perhaps it is significant that the comic addresses an idea of the author that is provisional and ever-changing. The use of comics form in the construction of the narrator creates a charged space; the valence of author and narrator vary throughout this space, and complicate further as the paratextual materials cited in this paper are encountered and added to the reading. The Long Weekend in Alice Springs is a work of nonfiction comics that uses multiple authorships to make an argument about historical narratives. The status of the author is both provisional and significant; as such, it suggests an attempt to convey the complexities of ownership, origination and authority in discussing place, race, and the collective unconscious. It sits at multiple borders of form and genre, including creative work, scholarship, the essay and nonfiction. It uses visual, textual, paratextual and narrative means to establish a hybrid form of narrator-author, and uses this hybrid construct to tell a continuous narrative. It is not produced by Indigenous creators, yet it is concerned with the relationship between Indigenous peoples and Western settlers. The form of the work and its origins open questions of authority and authorship, and thereby serve its contribution to knowledge, its creative value, and its themes. As the narrator contends on Saturday morning of the long weekend, he’s been ‘instructed by ghosts to analyse my own culture as though something important has been forgotten’; the subject is the ‘overlap between my culture and Aboriginal’. In establishing a state between authors, adapters and adaptations, it makes an argument about the significance of stories. It suggests a form suited to discussing the continued impact of racial violence, a site where ‘Trucks from the past are still delivering’ (San Roque 2004: 53). We acknowledge the Wurundjeri people as the traditional owners of the land on which we read and research, and the Arrernte people as the traditional owners of the land on which The Long Weekend in Alice Springs takes place. We respectfully recognise Elders past and present. Ronnie Scott is a writer and academic at RMIT University where he teaches a nonfiction studio, an Honours lab and Professional Research Project: Writing and Publishing. He is the author of Salad Days (Penguin Specials 2014) and founder of The Lifted Brow, an independent literary magazine. His research interests include contemporary fiction, new forms of nonfiction, independent publishing, space and time in text and comics, and Australian comics 1980-2020. Elizabeth MacFarlane is a writer and academic at the University of Melbourne where she teaches Graphic Narratives, Theory for Writing and Short Fiction. She is co-director of the Comic Art Workshop residency and of Twelve Panels Press. Her writing has been published in TEXT, New Scholar, New Antigone, Meniscus, Visible Ink and Space. She published her book Reading Coetzee in 2013, and her edited collection Superhero Bodies will be out through Routledge in December 2018.